Tomatoes and peppers are the most popular home crops of all. Neither takes up much space and both are relatively easy to grow. Both tomatoes and peppers have the same soil, water and sun requirements, making them good garden companions. They grow and ripen at the same rate and, when growing together, will enhance the growth and the flavor of the fruit. 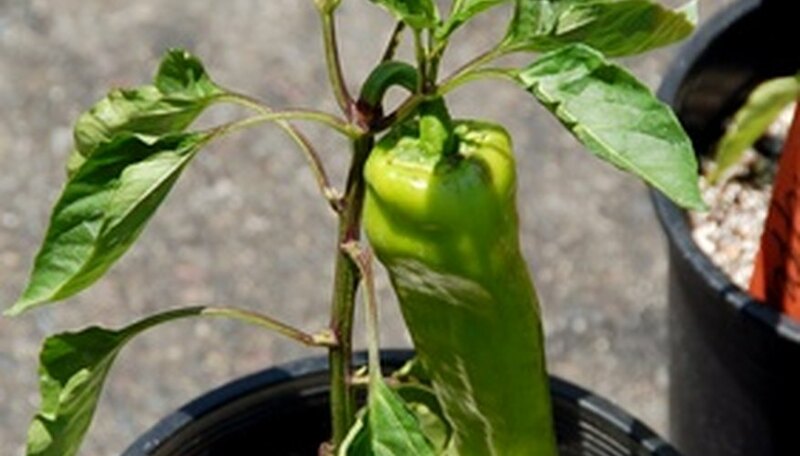 Most varieties can be planted together but the best peppers to plant with tomatoes are sweet, bell, or banana peppers. Both tomatoes and peppers can be grown in a garden plot or in containers. Purchase tomato and pepper transplants at the garden center. Both tomatoes and peppers can be grown from seed, but it is difficult to give the seedlings the correct amount of sun unless grow lights are used or they are placed in a greenhouse. Tomato transplants should be 8 to 10 inches high with a thick stem and many leaves. Pepper transplants should have at least three to five leaves. If there are blossoms on either plant be sure to remove them before planting. Tomatoes and peppers take a long time to mature, and using a transplant gives a little extra time for the fruit to form and ripen. Turn over the soil in the garden with a shovel and break up any large clumps. A deep rototilling will allow to plant tomatoes and peppers deeply. Tomatoes need to be planted deep in the garden soil. They also need about eight hours of sun per day, and they drink a great deal of water. Be sure the location of the garden gives them enough sunlight and is near a water source. Both tomatoes and peppers grow best in well-drained soil that does not hold water. Take a soil test. 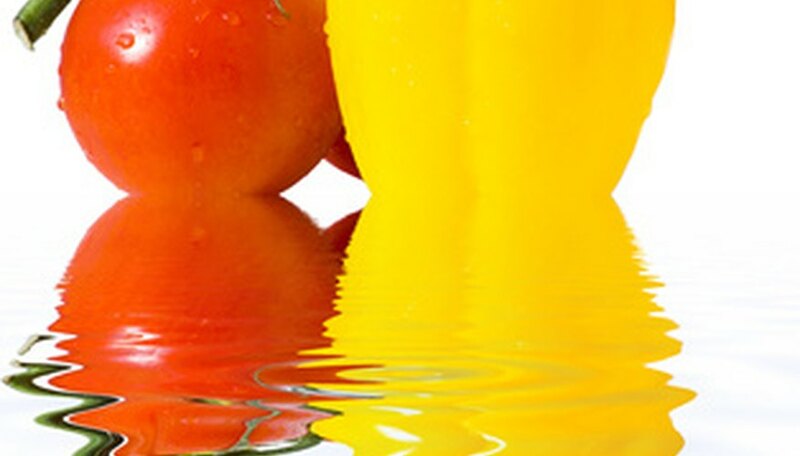 Tomatoes grow best in soil with a pH of about 6.5 to 7 and peppers in soil with pH of 6 to 6.8. Try to keep the pH of the entire area at about 6.5. Add some compost and peat moss to the soil to give it a softer texture, and amend the soil to get the correct pH. Before planting, add low-nitrogen 8-16-16 fertilizer. This will ensure the tomatoes and peppers are getting the correct nutrients. Harden off the plants once the weather warms to around 60 degrees Fahrenheit by placing them in an area with filtered sun a few days. Bring them back in at night. Place them in a sunny spot for a few days and bring them in at night if the temperature goes below 50 degrees Fahrenheit. After about one week they are ready to plant, but do so only if all danger of frost has passed and night temperatures do not go lower than 50 degrees. If it does, the plants will need to be covered at night. Remove the pot in which the plants have been growing. Make sure their roots are untangled and loose. 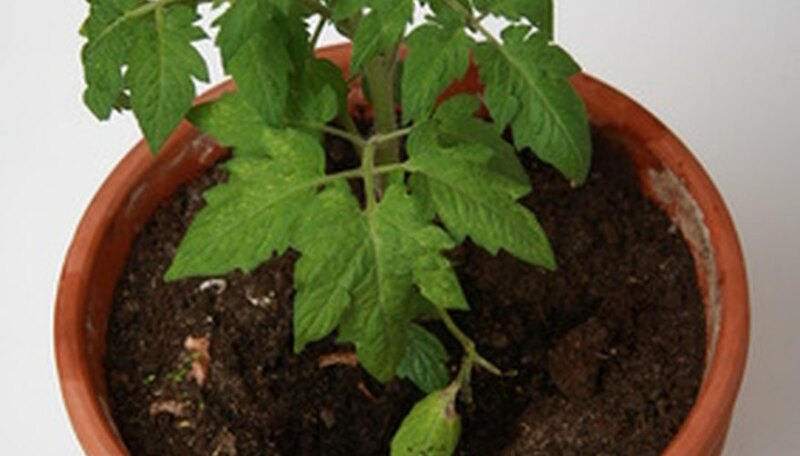 For tomatoes, dig a hole that will accommodate the roots and enable the plant to be a little deeper in the soil than it was in the pot so the lower leaves are almost on the ground. Dig a hole with a trowel large enough to accommodate the roots of the pepper plants and plant about 1 inch deeper than it was in the pot. Water right after planting and keep the plants watered well throughout the first two weeks. Plant tomatoes at the back of the garden, because they are tall and will prevent sunlight from hitting the peppers at some points of the day. Always insert the tomato cage or stake to tie up the tomatoes when planting so that the roots will not be disturbed later. Plant tomatoes about 24 inches apart. Planting them closer will stop air circulation around the plants, and they can be affected by disease easier. Rows need to be at least 4 feet apart. Once the tomatoes start to grow tall, make sure to weave branches through the tomato cage or tie them to the stake so they remain upright and away from the ground. This will also prevent disease. Pepper plants should be planted 18 inches apart and rows should be about 24 inches apart. Plant the first row closest to tomatoes about 24 inches from the tomato. Prune some tomato varieties during the season. 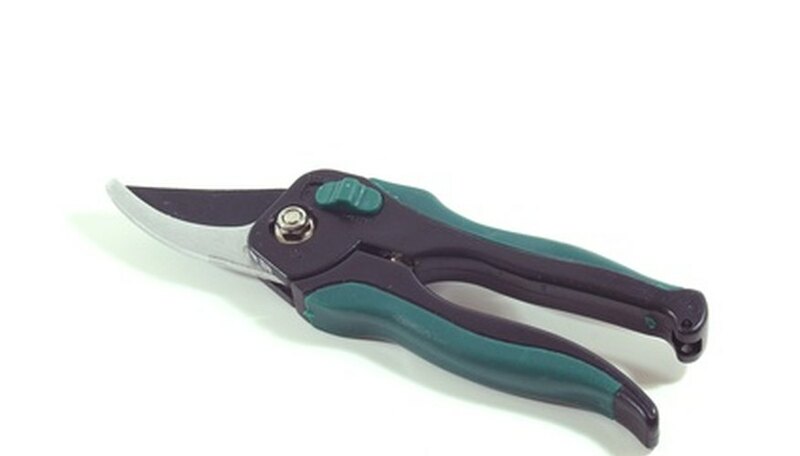 Branches and leaves that cannot be contained in a cage or that grow higher than the cage may be removed with pruning shears at the V of a stem where a leaf meets the stem. Also be sure to control any weeds that might compete for the nutrients in the soil and water the tomato and pepper plants need. 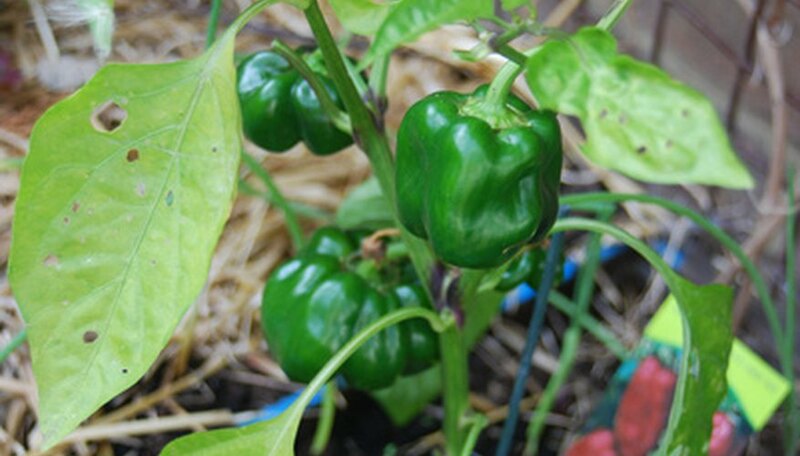 Pepper plants do not need to be pruned, but be sure the tomatoes are not growing so tall they shade the pepper plants from the sun. Water tomatoes and peppers at ground level, and do not sprinkle them. Wet leaves can contribute to disease. Use a watering can or drip hose and make sure the plants get 1 or 2 inches of water per week, including rainfall. Mulch the roots with straw so the water is retained longer. Fertilize when tomato and pepper fruits are about 1/3 of the size they will be at harvest. They should develop at about the same rate. Use a high-nitrogen fertilizer like 12-12-12 and scratch it into the ground near the base of each plant. Do not get it on the foliage of the plant. Fertilize again two weeks after the first tomato has been picked, then another time one month later. Harvest should be about 70 to 80 days from the time they were planted. 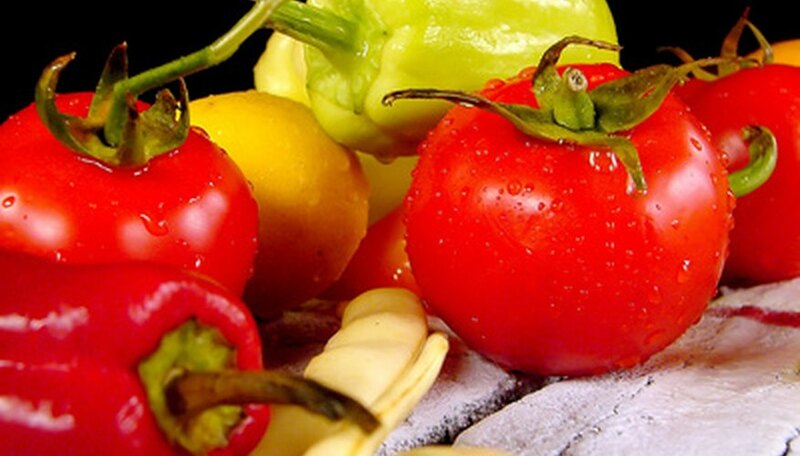 Both tomatoes and peppers grow better in temperatures about 75 to 80 degrees. They both enjoy warm nights. Plant basil with peppers and tomatoes, as this will keep harmful insects away from them and also enhances their flavor. Make a solution of 2 tbsp. epsom salts to 1 gallon water and pour it on the peppers once fruit has set. This will cause the peppers to have a thicker skin; it won't hurt the tomatoes, either. Do not plant the peppers too close to the tomatoes. Remember that tomato plants will branch out and get wider, and if they shade the pepper plants too much, the pepper plants will not grow or bear fruit. Why Do the Leaves of a Tomato Plant Turn Yellow? What Vegetables Should Be Planted Next to Each Other in a Garden?